Mutations: Cosmetically common. Ability mutations like those Fringers have are plot approval. 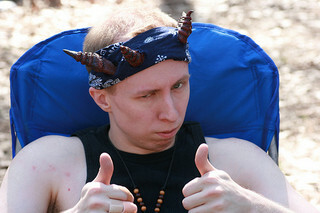 Make-up Requirement: All Dahhak players are required to wear a minimum of one pair of horns. It is also common for Dahhak to have fangs. Genetic Advantage: Strong Will – Dahhak players start with the Advantage: Strong Will. See Advantages and Disadvantages in the Rulebook for more information about Strong Will. Genetic Disadvantage: Chemical Addiction – Dahhak are inclined toward chemical addiction. Dahhak players gain 1 additional point for the Disadvantage: Chemical Addiction and 2 additional points for the Disadvantage: Severe Chemical Addiction. Refer to Advantages and Disadvantages in the Rulebook for the rules on Chemical Addiction. 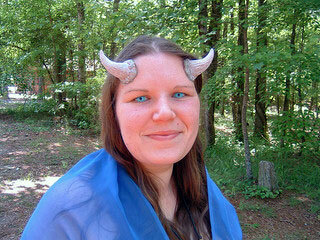 Were it not for the horns, a Dahhak would appear almost human. Commonly, most have only one set of horns, but it is not unheard of to see many variations and stable mutations with several horns, fangs, and other strange features. These Dahhak are often seen as gifted and are usually set a prominent place within their society. This Tribe is often seen as underhanded, loving the life of the wheel and deal. They are not the accomplished merchants that the Midir are, though they do excel in crafting and are known to be slavers. In history, the Dahhak were the masters of the Kshathra until about 200 years ago when the Kshathra revolted against them, stealing their sacred home world Vairya in what is now called the “Night of the Betrayer.” The Dahhak have never quite gotten over this and, until recently, held an unbearable hatred toward the Kshathra. It was only over the course of the past few years that the two races began work in earnest to put the past behind them work to together in the face of the Thinking Machine invasion. Now that the war is over, there’s no telling how the two will continue to behave around each other. Dahhak favor bladed weapons and many follow the tenets of the Kataya Martial Discipline. They generally dress as finely as their finances will allow, favoring tailed coats and jerkins (sometimes brocaded) paired with light, loose pants in a variety of colors. They strive to reach an ideal balance between distinguished fashion and fighting functionality. During the war, the Dahhak set off a massive explosive device on their own home world of Asha to prevent the advance of the Machine armies and buy the rest of the galaxy more time to prepare. This selfless act completely changed the majority of the galaxy’s opinion of the race. Where before they had seemed self-serving and elitist, Dahhak now became respected veterans of the war effort. Slavery and old hatreds were put aside at the magnitude of their sacrifice. This act earned them an welcomed place in the settlements of both Morgan’s Landing and the Compound, and even a measured respect from some Kshathrans. Genetic Ability: Excrete Pain Poison – The Dahhak possess a gland that excretes toxic saliva that can be applied to a bladed weapon and follows the standard rules for blade poisons. This natural toxin takes 10 seconds to apply and the player should roleplay licking the blade of the weapon. The toxin causes a Pain effect to the victim. The tagline for this attack is “Pain Poison”. This poison will lose its potency if not used by Dusk. Genetic Ability: Resist Poison – A single, stackable resistance to a Poison delivered effect. This power may never be transferred to another character. Racial resists do not need to be “activated” and all Resists are considered reset at sundown. Genetic Ability: Suggestion – This racial ability allows the Dahhak to issue the target a Suggestion effect. This is a point delivered effect that can only be stopped by a Resist Mental effect. For more information on Suggestion effects, see the Effects List.